Description: The Flashcard Flipper is a yellow plastic case that is designed to hold flash cards and then advance them one by one. The yellow case has a red knob on both sides of the top that turns the flashcards. There is a blue hinged door at the bottom of the case for loading the flashcard set. Designed for children ages 3 to 8 years old. FPT45020 - Small hand-held yellow plastic case that is designed to hold flash cards and then advance them one by one. The case has a red knob on both sides of the top that turn the flashcards. Has a blue hinged door at the bottom of the case for loading the flashcard set. 40 double sided flash cards (80 questions total). The cards are white with a colored bar across the top and questions on both sides. Sold in a 7-1/2" long, 6" high, 2" deep box. 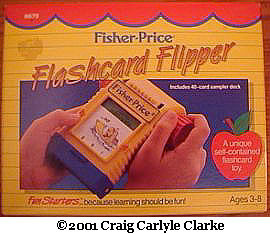 Also see #6672 Flipper Flashcards Assortment for other flashcards that can be used with the Flashcard Flipper.